Jessica Choppin Roney, Governed by a Spirit of Opposition: The Origins of American Political Practice in Colonial Philadelphia (Baltimore: Johns Hopkins University Press, 2014). Are you looking for a break from a busy weekend of watching the NFL playoffs? Or maybe you need some light relief while finishing up your syllabi for the new semester? 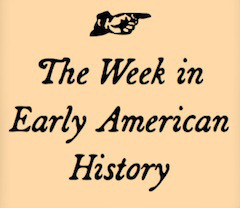 Never fear, The Week in Early American History is here!